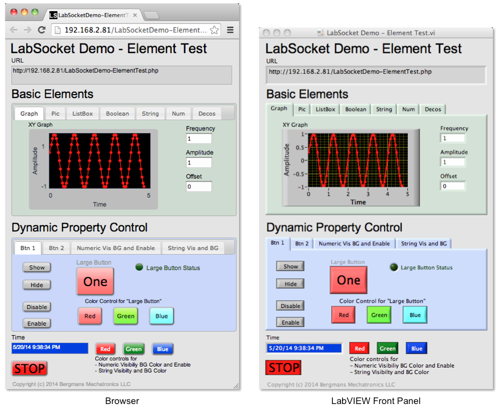 LabSocket renders many common LabVIEW front panel elements in the browser. In addition, for many of these elements, dynamic synchronization of front panel element properties is also performed. Below is a series of short videos, as well as screenshots, that highlight some of these capabilities. High-fidelity replication of indicators is possible using the "#LS_image" preprocessor tag. If this string is included in an element label or caption, that element with be represented as a dynamically updated PNG image in the browser. The following video demonstrates this capability. As discussed in detail in the User Guide, the "#LS_image" processor tag accepts optional arguments for compression level and decimation rate to allow developers to fine-tune the performance of the system. A Picture Ring is an element that allows an integer value to be represented by an image. LabSocket allows picture ring controls and indicators to be represented in the browser, as illustrated in the followings video. Booleans with Images, a close relative of picture rings, enable images to represent each of the two states of a Boolean element. 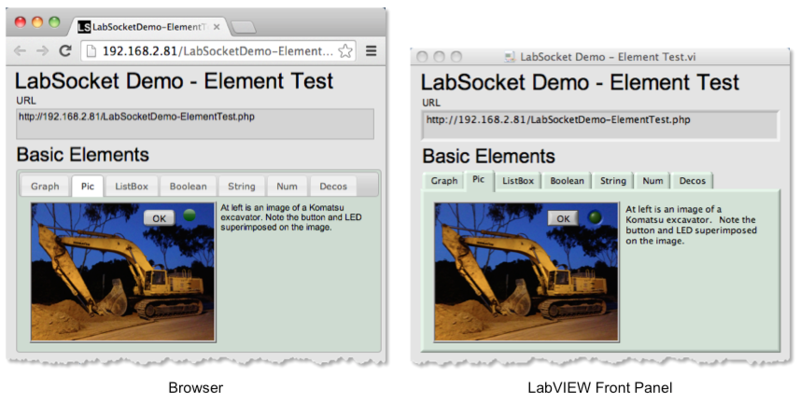 LabSocket enables these types of elements to be represented in the browser. LabSocket also accurately replicates any stock boolean element that is saved as a type def. This video illustrates both of these capabilities for control and indicator elements. Also related to Picture Rings are enumerated types. This element allows an integer value to be selected or displayed using a list of menu items. LabSocket supports enumerated types as controls and indicators, as shown in the following video. LabSocket continuously synchronizes the value of picture elements. This is a useful feature for applications that display animations or other dynamic imagery. A video of this capability is shown here. Dynamic picture support is not yet available for cRIO-903x platforms. Some applications require that a user be able to select a row of data in a MultiColumn ListBox. LabSocket allows MCLB row selection in the browser, as shown here. MCLBs are not yet supported on cRIO-903x platforms. In some situations, it is desirable to disable synchronization or visibility of specific front panel elements. As shown in the following video, the LabSocket preprocessor allows the developer to control these properties by placing the tags "#LS_no_sync" and "#LS_no_display", respectively, in front panel element labels and captions. By popular demand, tab pages are now synchronized by default, but can be unsynchronized using the Preprocessor, as shown here. The screenshots below illustrate the replication in a browser of several LabVIEW front panel element supported by the LabSocket system. These screenshots are from the VI "LabSocket Demo - Element Test.vi" that is included with LabSocket-Basic. Click on the screenshots for larger views. Screenshots of MultiColumn ListBox support are also shown here. "LabSocket Demo - Element Test.vi" demonstrating XY Graph support (top). Bottom section of this VI demonstrates dynamic synchronization of boolean control properties. 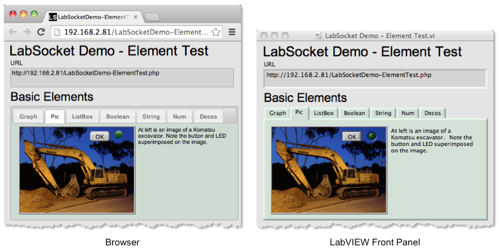 "LabSocket Demo - Element Test.vi" demonstrating picture element support. Other elements may be superimposed on the picture element, as shown here with button and LED.